Do you have cracks in your ceiling? Find out if the cause is simply cosmetic, of if you're facing a structural issue that needs immediate attention. Q: I just noticed a crack in my ceiling, but I’m not sure how long it’s been there. Is it a normal symptom of an aging house? Or is it an indication that something is dangerously wrong? Should I be worried? A: Over time, virtually all homes will develop cracks that are cosmetic in nature and not indicative of a larger problem. But some cracks—especially those wider than 1/8-inch—may signal structural issues. Examining the shape, size, and location of the crevice can give insight into possible causes and solutions. Here’s how to deal with cracks in the ceiling, whether they appear in the bedroom, kitchen, basement, or other room of the house. 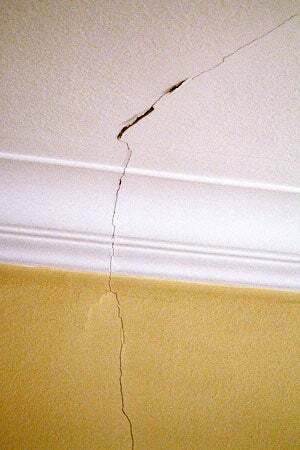 A fine straight ceiling crack could be the result of a poorly taped joint. If an insufficient amount of drywall mud was used during the taping process, the paper tape won’t adhere well to the joint. As a result, you may notice a straight “crack” along the edge of loosened tape. Homeowners can choose to ignore this superficial problem, since it isn’t a structural or safety hazard. You can also minimize the appearance of the crack by applying a small amount of thin drywall compound under the loose tape and re-adhering it to the drywall. A discolored crack indicates a moisture problem. Sometimes, water from an overhead leak can trickle between the ceiling’s drywall panels, causing the joint tape to loosen, creating the appearance of a crack, and leaving unsightly yellow or brown stains. Before you can repair the ceiling, determine the cause of the leak and fix it. Then, scrape off the loose tape and re-tape the joint, either with a drywall repair kit or paper tape and joint compound. If you have a textured ceiling, use an aerosol texture product (found in home improvement stores) to cover the newly re-taped joint so it blends into the ceiling’s existing texture. Note: Drywall will resist some moisture, but long-term leaks can result in water damage, which requires replacement of the damaged drywall. If the drywall has swollen or softened, it’s no longer viable; the damaged section must be replaced before re-taping and re-texturing. Tiny spiderweb cracks may suggest thick application of drywall compound. Thinned drywall compound is often used to create a textured ceiling. If it was applied too thickly, you may notice tiny cracks that run in all directions because the compound shrinks as it dries. 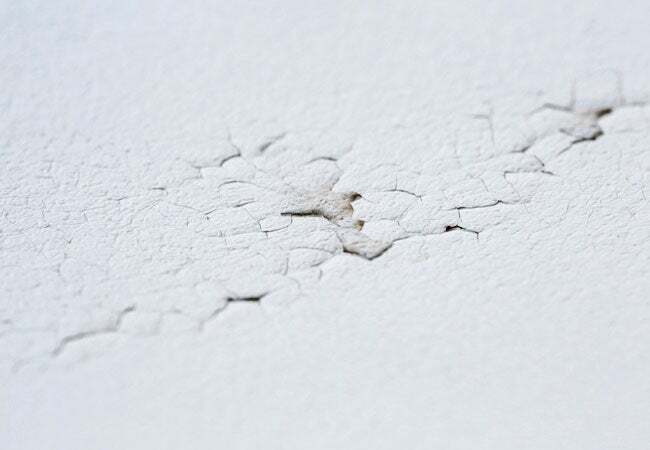 To conceal the blemishes, try applying a thin layer of drywall compound over the existing texture. You could also remove the existing texture by sanding—a messier prospect—and apply new drywall compound to the ceiling. Truss uplift can cause a horizontal crack between an interior wall and the ceiling. Roof trusses are designed to move slightly as their wood members expand and contract with attic temperature and moisture fluctuations. When the roof truss pulls upward, it may lift the ceiling drywall along with it, creating a crack between the wall and the ceiling. This common mistake often occurs if a handyman attaches drywall panels to the trusses near the edge of a non-load bearing wall. The only way to permanently fix the issue is removing the nails or screws that secure the edge of the drywall panels to the trusses, and reattaching them to clips or blocks installed on the top of the interior wall plates. It’s best to hire a professional for this project. If a homeowner doesn’t care to repair the issue, they can camouflage the crack by installing dark-stained crown molding around the top of the room. The molding should be attached only to the framing members in the wall—not to the ceiling joists. This cosmetic repair won’t stop the trusses (and the ceiling drywall) from lifting with moisture and temperature changes, but the dark color of the molding will disguise the appearance of the crack, while also adding a decorative touch to the room. Ceiling cracks accompanied by wall cracks could be the result of the house settling. Homes naturally settle as they age, which can create crevices in the walls and ceilings typically above doors and windows as well as in corners. These superficial hairline cracks can usually be re-taped—but, if the house continues to settle, the cracks are likely to reappear in the same spots. If the gaps are wider than 1/8-inch, it’s a good idea to consult a reputable home builder, since you may have a structural problem. In older homes with plaster ceilings, movement and moisture may create cracks. Since plaster is extremely rigid, the slightest movement can cause a gap. Typically, plaster ceiling cracks have two causes: house settling and temperature or moisture fluctuations in an attic, which result in the expansion or contraction of framing members. Homeowners can fill these commonly occurring hairline cracks with new plaster and repaint the ceiling. If you have wider cracks or sections of loose plaster, the lath system beneath the plaster is likely failing—in which case, the plaster should be removed and replaced with drywall. Large cracks on a bowed ceiling could indicate a structural problem. When a ceiling bows or sags, you have a problem that requires prompt attention. If you’ve recently installed something heavy on the floor above—such as a hot tub, a waterbed, or a pool table—the ceiling joists might sag under the excessive weight. A ceiling may also crack or bow due to the incorrect removal of a load-bearing wall or damage to other support members. A structural engineer or a reputable builder should examine the ceiling as soon as possible to determine the best way to remedy the situation.